Luis Rodriguez has been working with Global Family since 2008. He’s an amazing birder and is married and the father of two beautiful kids. Luis loves to mountain bike around Costa Rica and go for early morning runs especially in the mountains and countryside. He enjoys being a tour guide because he gets to know people from all over the world and share with them his own little piece of paradise that he calls home. 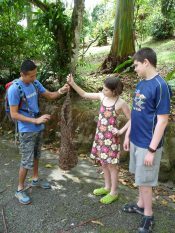 He is a certified tour guide and continues learning about Costa Rica’s nature with guide courses each year. Jose Pablo Ugalde has been working with Global Family since 2011. Jose Pablo, sometimes known as “Chicken Little,” has eight years of experience in the tourism industry, but his passion for discovery developed at a very young age, when he joined his father on a variety of Costa Rican tours. 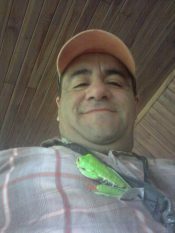 In addition to being a certified tour guide (Costa Rican Tourism Institute, or ICT), Jose is a licensed naturalist guide, certified by the National Institute of Biodiversity (INBio). 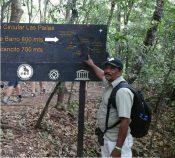 He has worked for extended periods in the areas around Arenal and the Osa Peninsula as a local guide. Jose, like his father, is a lifelong nature lover and an enthusiastic bird-watcher. Leo has been working with Global Family since 2013 but has 16 years of guiding experience. He loves sports, especially soccer. He’s into botany and can share the names and stories of many plants and identify birds by their calls. He has certifications in tourism, botany, birds, volcanology and first aid. 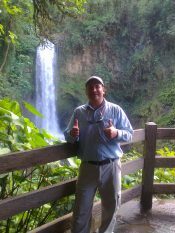 Gil has been working with Global Family since 2013 but he has 20 years of experience as a naturalist Costa Rican tour guide, certified by ICT and a tourism suitability certification also by ICT, technical degree in travel company management and transportation logistics. He is married to Marlen who he says is a beautiful Costa Rican flower that he found 16 years ago during one of his trips as a tour guide and is the father of 2 boys. Diego Gonzalez has been guiding for Global Family since 2014. He’s a nature lover who really enjoys teaching his explorer friends about the beautiful landscape, history, folklore and wildlife of Costa Rica. His specialty is reptiles and amphibians, plus some bird-watching and “anything that suddenly appears on our path.” He’s a certified licensed tour guide. Diego lived in Minneapolis for two years where he studied English. He is married and has a little girl, Sophie, and a stepson Johan, who just graduated with a master’s degree in journalism. He enjoys spending as much time with his family as possible. His hobbies include riding a motorcycle through the mountains, and flying remote control airplanes, helicopters and a drone (aerial photography). Diego loves hiking in the forest. He says, “I love to meet new persons were I can learn from them, and they can learn from me.” Go Diego Go! Dauren is a certified nature guide with 22 years of experience. 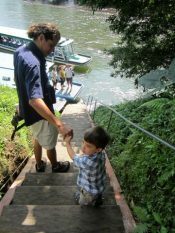 He enjoys living surrounded by nature, volcanoes, lakes, and wildlife with his wife Guadalupe, and two sons, Fabian and Matias. In his free time, he likes to hike, run, bike , and bird watch. He also enjoys his job guiding people from all over the world around Costa Rica . Kevin Herra Martinez has been working with Global Family since 2006. Another fantastic birder, Kevin is a new dad and likes to go whitewater rafting in his free time. He operates Andrea Cristina B&B and Tierra Hermosa Wildlife Rehabilitation Center with his family and his rafting and birding business is growing strong: Green Rivers Rafting and Green Ibis tours that include quiet water rafting for families with kids 4-8, wilder rafting for adults and teens, bird watching and tours to Tierra Hermosa.